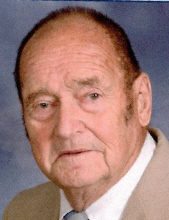 Russell G. Kamps passed away peacefully at his home in Crivitz on April 5, 2019. He was born in Milwaukee on September 10, 1928 to Theodore and Harriet (Berth) Kamps. He married the love of his life, Arlean V. Techmeier, on June 29, 1951 at Zion Lutheran Church in Peshtigo. After 57 years of marriage, Arlean preceded Russ in death on August 21, 2008. Russ served in the U.S. Army Airborne Infantry and was honorably discharged in 1952. For most of his career he was self-employed with Arlean by his side. They had a real estate business, developed land and built many house in the Coleman and Crivitz area. Survivors include a son, Tracy (Deb) Kamps; a daughter, Trudy (John) Gokey; two grandchildren, Jeremy (Jessie) Gocht and David (Ashlie) Kamps; 5 step-grandchildren; 14 great grandchildren and 2 great-great grandchildren. Russ was preceded in death by his parents; two brothers Theodore Jr., and Eugene; and a sister, Gwendolyn (Orville) Zorn. Visitation will be held at Grace Lutheran Church, 716 Henriettea Ave, Crivitz, on Saturday, April 13, 2019 from 3 to 5 p.m. The funeral service will follow at 5 pm at the church with Pastor Jon Zietlow officiating. Russ will be laid to rest in Trinity Lutheran Cemetery in Coleman. A special thanks to (step) grandchild, Chris Johnson for all he has done to care for his grandfather for the past 2 years and thanks also to Deb Kamps for her assistance over the past eight years and to everyone at Unity Hospice who made his final days more comfortable. To send flowers or a remembrance gift to the family of Russell G. Kamps, please visit our Tribute Store. "Email Address" would like to share the life celebration of Russell G. Kamps. Click on the "link" to go to share a favorite memory or leave a condolence message for the family.